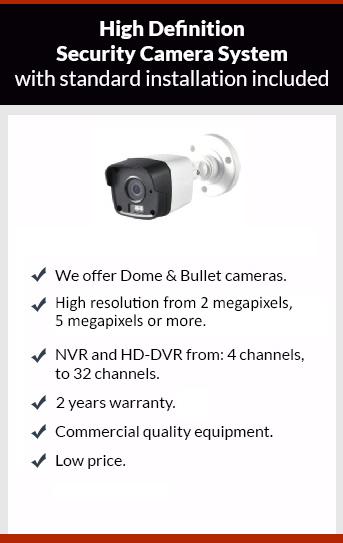 Get affordable Security Camera Installation on Lawndale, CA and CCTV equipment with commercial quality and 2 years warranty. We have been working on Lawndale, CA, since 2005. When we install a CCTV camera we’ll need to run some wiring and make some drilling, before to do this we always ask for permission of the customers to do the proper CCTV installation. If we install outdoor cameras, these will be waterproof. All our security cameras has a night vision, you’ll get a perfect picture at night. After installation we’ll ask you to download an app from Google Play Store or Apple app store on your phone. After app installation you’ll be able to see your camera remotely. We don’t risk the reliability of our systems, that’s why we only do professional installations on wired security camera systems. Give us a call to book your appointment to get your free estimate. We Install Surveillance cameras in the following cities in LA County. We Install Surveillance cameras in the following cities in Orange County and San Bernardino County. Protection4less.com © 2018. All rights reserved.